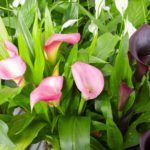 There many white shoots off the calla lily rhizome. What do I do with them once I dig up the rhizome? Do I cut these off to store or store them with the roots? Do not cut the rhizomes, leave them intact.